After all the rush rush and fun fun leading up to and peaking at Christmas its real nice to chill out on the boat in one of the heavenly bays in Pittwater. 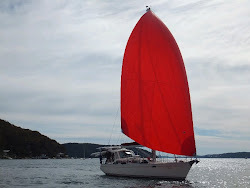 Pittwater is a large body of water just north and about a 45 minute drive from where we live in Sydney. Its beauty is breathtaking! We - me, Mr. G, and Molly - got to the boat this afternoon. Took a quick motor just across the bay to a national park bay called Towlers Bay. Because this is holiday time the bay is packed with big and small boats all enjoying the day. BBQ dinner tonight with baked potatoes on the grill off the back of the boat ... nice wine ... and I'll finish with another round of Downton Abbey....I'm almost through series 1...series 2 to go. Mr G isn't in to it but he humours me...good man that he is. Sorry for the short update today...wine is getting warm and the grill is ready. More tomorrow (maybe). Here's some more pics of this beautiful area. Enjoy will!